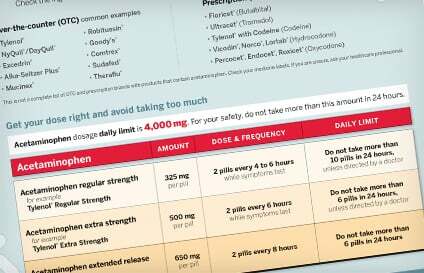 Reinforce your patient counseling with these concise, visual, easy-to-understand handouts on how to choose, use, and dose OTC pain relievers appropriately. Help patients be active participants in their own recovery. 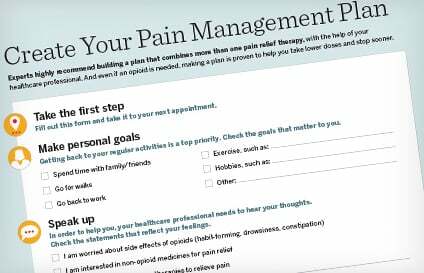 Simple checklist includes personal goal setting, treatment concerns, current medications, OTC analgesic dosage charts. 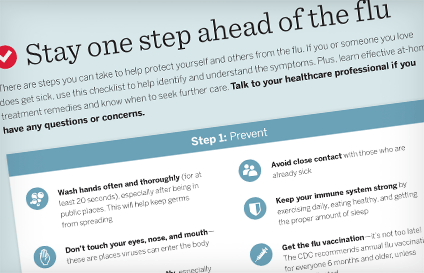 Helps patients take steps toward preventing the flu, recognizing common symptoms, and understanding treatment options for both children and adults. 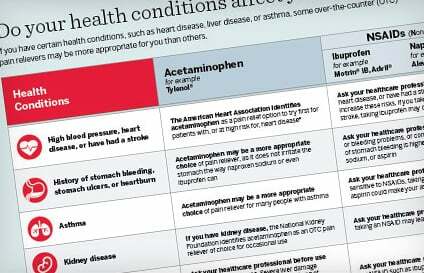 Teaches patients how to check both their OTC and Rx medicines to see if they contain acetaminophen, and why this is so important. 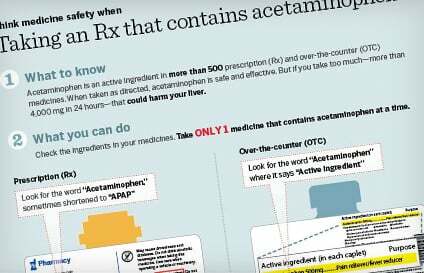 Discusses appropriate acetaminophen use—from OTC acetaminophen basics like dosing directions to tips for avoiding harmful side effects. 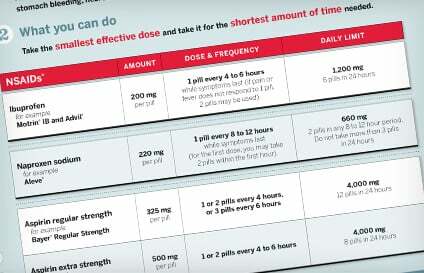 Discusses appropriate OTC NSAID use—from NSAID basics like dosing directions to tips for avoiding harmful side effects. 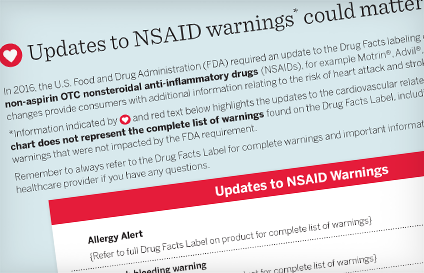 Teaches patients what changes were made to the Warnings section on the OTC NSAID label. Gives a list of certain conditions that may affect OTC analgesic choice, and advises patients to talk with you about their health history. 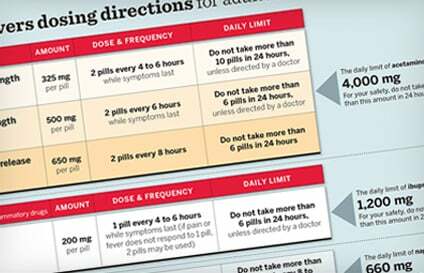 All-in-one chart features directions, including maximum single and daily doses, for OTC acetaminophen, ibuprofen, naproxen sodium, and aspirin. 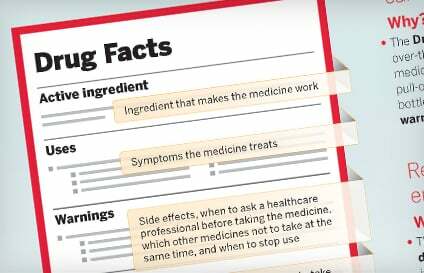 Helpful graphic demystifies the Drug Facts label and shows patients how labels promote medicine safety. Checklist helps patients understand what may affect OTC analgesic choice. 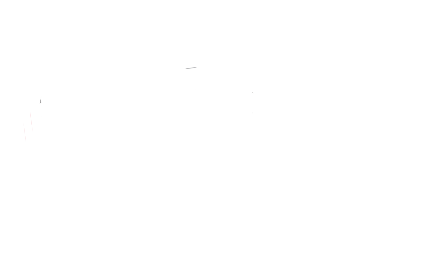 Educates patients to take ONLY 1 medicine containing acetaminophen or an NSAID at a time.